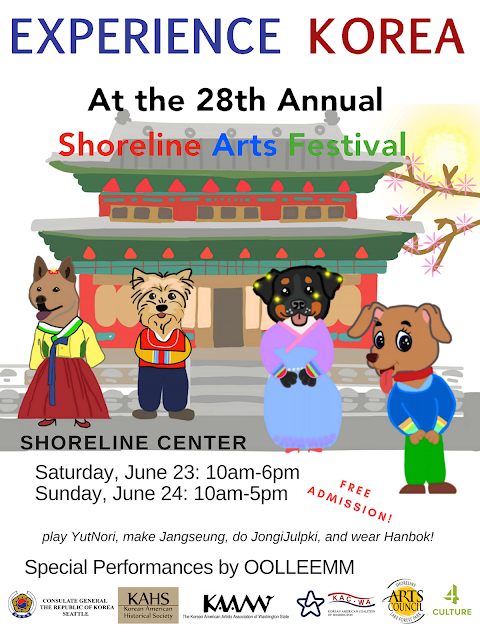 Korean American Historical Society (KAHS), in collaboration with the Korean American Artists Association of Washington and Korean American Coalition of Washington, is hosting a Korean and Korean American heritage, culture, and arts room during the 28th Annual Shoreline Arts Festival on Saturday, June 23, 2018 and June 24, 2018 at the Shoreline Center, 18560 1st Ave NE, Shoreline. Enjoy Korean American culture and arts in a safe, fun, and inviting environment. At this free event, visitors will have an opportunity to experience Korean heritage, culture, and arts through all the senses: visual, auditory, and kinetic. Visitors will be able to view works by local Korean American artists, participate in arts and crafts, read about Korean history and culture, play with traditional musical instruments, and wear traditional clothing. Fun activities and demonstrations in the room for the whole family will include JongiJulpki (paper folding), making Jangseung (guardian spirit poles) using paper towel rolls, playing the game of Yut, writing your name in Korean, and coloring activities for younger visitors. Everyone will enjoy playing with Korean drums, and wearing traditional Korean clothing. We will also feature performance by Ooleemm on the center stage on Saturday at 4pm and 5pm. The full schedule of activities is here. Experience Korea! Is made possible by funding from the Consulate General of the Republic of Korea in Seattle, 4Culture, and the Shoreline Lake Forest Park Arts Council. The Shoreline Arts Festival (SAF) is an annual community event which attracts over 10,000 persons of diverse age and background over a course of two days. SAF highlights arts and culture, as well as various ethnic cultural arts of Chinese, Japanese, Korean, Middle Eastern, and more. Korean American Historical Society is a 501(c)3 nonprofit organization dedicated to enriching the collective memory of Koreans living in the United States and abroad and promoting awareness and pride in the ethnic heritage and experience of Koreans. Korean American Artists Association of Washington (KAAAW) is a 501(c)3 nonprofit organization founded in 1989 to encourage and support Korean American artists residing in Washington state who are pursuing artistic endeavor to enrich personal and community life, as well as to promote and celebrate Diversity through Pacific Northwest student Art Competition open to K-12, for all ethnic backgrounds. Korean American Coalition of Washington (KAC-WA) is a 501(c)3 nonprofit, nonpartisan community organization whose mission is to empower the Korean/Korean-American community, and enhance its profile and influence.